Organize a fully paid up group of fifteen people or more for return travel on any Air Niugini flight and you “earn” a free return ticket for yourself. Do this multiple times and earn more free tickets. 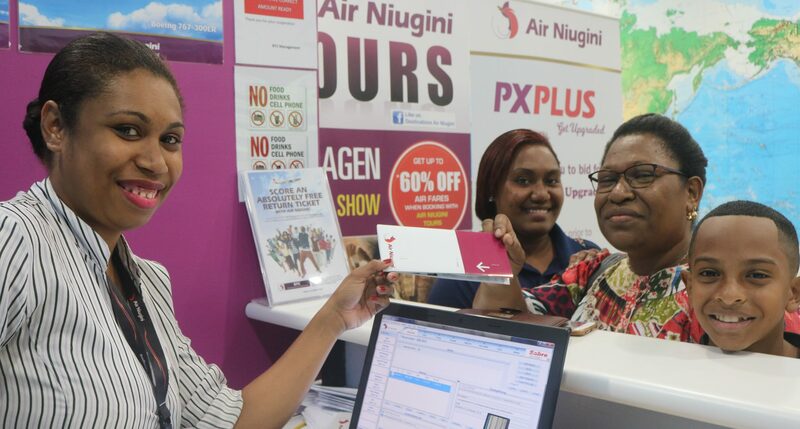 This is part of the current promotion called Ab-Free (Absolutely –free) ticket being carried out jointly by Air Niugini and its subsidiary companies, Link PNG and Business Travel Centre (BTC). BTC’s General Manager Mr Floyd Smith who is co-coordinating the promotion said the initiative involves Air Niugini’s domestic and international sectors and is targeting first time travellers travelling for leisure, church activities, island breaks or any activity that conjures fun, recreation and relaxation as a group. The GTO must be 18 years or above and should liaise directly with BTC, Air Niugini Travel Centre or their preferred Travel Agent. Mr Smith said the GTO must ensure that all travellers’ documents are valid, passports have a minimum of 6 months to expiry and appropriate visas for international travel are in order. “The GTO is responsible for collecting all funds and depositing at BTC, Air Niugini or their Travel Agent and will then distribute the group tickets once all finalized. An alternate GTO may also be appointed to act in the absence of the initial GTO organizing the trip. These details are to be provided in writing to the booking office as to avoid dealing with multiple persons”, Mr Smith said. The ‘Ab-Free’ ticket promotion commenced on 30 June 2018 and will continue until mid-2019.